For all of those of you who chose the Alaska Avalanche Information Center as your non-profit benefactor this year during #GivingTuesday, Thank You!!! from all of us who work diligently to ensure everyone has access to important, relevant information that can saves lives! We could not do what we do without your support. As the Executive Director of this organization I have learned how deeply it is that people drive this mission. People like Richard Strict Jr who was setting trail for the Iditarod Sled dog race in 2006 when a mountain of snow buried his future and all of those who loved and knew him. ‘Beyondo’ his mother Sharon said of him. “Richard loved to ride his snowmachine and be one with nature ‘beyondo’ anything else in the world!” She also told me of his kind, generous nature and acts of contribution to his community, friends and family. That too went ‘Beyondo’ the ordinary. And then I learned about Claire Sundgren from her mother Billie. Claire lost her life in 2016 on Courage Mountain near the famed Arctic Man event held each spring in the HooDoo Mountains. Claire wasn’t there for the race that day, she was there to soak up energy and embrace life. Billie describes a free spirited, talented young woman and mother of two amazing boys. Billie not only lost her beloved daughter, but her grandsons as well. She has not been able to reach or see the boys who are living with their father, since shortly after the tragic events that buried her future. Then I learned about Dr. Liam Walsh from his mother Janet. “Liam loved life and doing everything possible to embrace every aspect, especially when it came to being outdoors,” she told me. 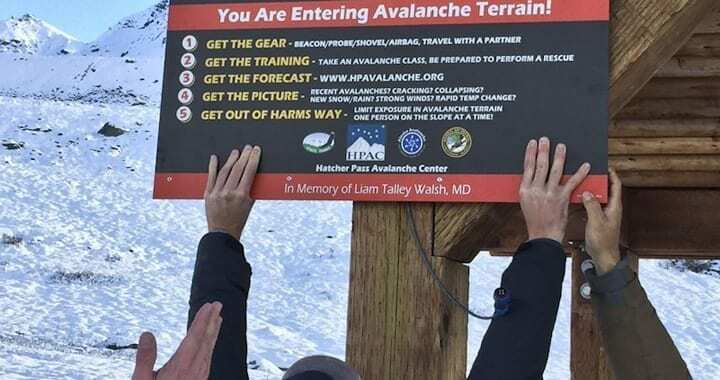 “He thrived on the thrill of the mountains and just as much, helping other people which is why he became a doctor.” He was buried in an avalanche in 2015 during a week-long snow event in Hatcher Pass. These are only a few of the more than 100 people who have lost their lives from avalanches in Alaska. I too have my own personal loss buried under a small mountain of snow and ice and dirt and feel touched by each and every story. I have found friends in the mothers of many of the victims from Richard, Claire and Liam to Keith Coyne, and Brendan Smart. An eclectic group of woman who share a common bond of loss. Thank you for making a donation to support the efforts of all those at the Alaska Avalanche Information Center who are working to spare other mothers, wives, families, friends… from experiencing this tragedy in the future.